We accidentally left the window open in my 2-year-old daughter’s bedroom last week when we went out to run errands. Some geese came in while we were gone, and now we don’t know how to make them go away. There are nine of them, and each of them seems to have a job of some kind. I wish they would leave. We’ve been watching video of the geese on the baby monitor, and this goose is clearly the leader. He is the biggest goose, and the other geese pay attention when he honks. Sometimes, he will stand up in the middle of the room and all the other geese will form a V behind him. He is the goose who gets to sleep in the toy box, which is where they all seem to think is the best place to sleep. I’m referring to this goose as a “he,” but I honestly don’t know how to tell if a goose is a boy or a girl. In my head, I guess I’ve just classified them all as boys. In the past week, I’ve tried going into the room dozens of times to shoo the geese out, and each time they’ve hissed and snapped at me until I’ve gone away. But there’s one particularly aggressive goose who seems to be the designated enforcer. He stands up real tall and spreads his wings in a threatening manner, and then he chases me. He’ll chase me out of the room and down the hallway, while all the other geese are afraid to leave the room. In my opinion, this goose is the worst goose. I wish he would leave so that my daughter could have her room back. This goose’s job is to protect their pile of valuable objects. The valuable objects are an orange peel, a roofing nail, an unopened tampon, a single earbud, a green shard of glass, and a rubber glove. They brought these things in from outside, and Treasurer Goose keeps them hidden beneath my daughter’s Princess Elsa wig from Halloween. The wig is filthy now, and we will probably have to buy her a new one. These two geese have the same job, which is to tear up my daughter’s bedsheets and mattress with their beaks all day long. I think they are married. At one point, I tried luring the geese out of the room with a trail of breadcrumbs, but they are not easily fooled. Only one goose ate any of the bread, and the other geese immediately thrashed him for it. He now has to live in isolation on top of the dresser. He is Traitor Goose, and his job is to be a living example of what happens when you betray your own kind. Did I mention that one of the geese figured out the hose? He dragged it through the window and had the water going for a good five minutes before I could run outside and turn off the spigot. Everything got soaked, and now one of the geese’s favorite leisure activities is to loudly slap their feet against the soggy carpet. My life is currently a nightmare. The geese go to the bathroom constantly. Sanitation Goose kicks all of the feces in the general direction of Traitor Goose. This way, all of the filth stays confined to one area. My daughter needs her room back. We did nothing to deserve this. Let’s not mince words. These geese are inconsiderate savages, and they are ruining my life. My wife and I are tired of having our daughter have to sleep in our bed. It is putting a strain on us all. But there seems to be one goose who is at least a little bit reasonable. He is the Goose Of Reason. While the rest of the geese have been incredibly hostile towards me, Goose Of Reason has shown me some basic decency. One of the times I went into the room, he waddled over and dropped an empty 20-oz. Pepsi bottle at my feet—a peace offering, perhaps. I’ve also watched him on the baby monitor defuse several goose-on-goose altercations, including a particularly nasty scuffle between Treasurer Goose and Sanitation Goose over who got to eat my daughter’s Olaf doll. 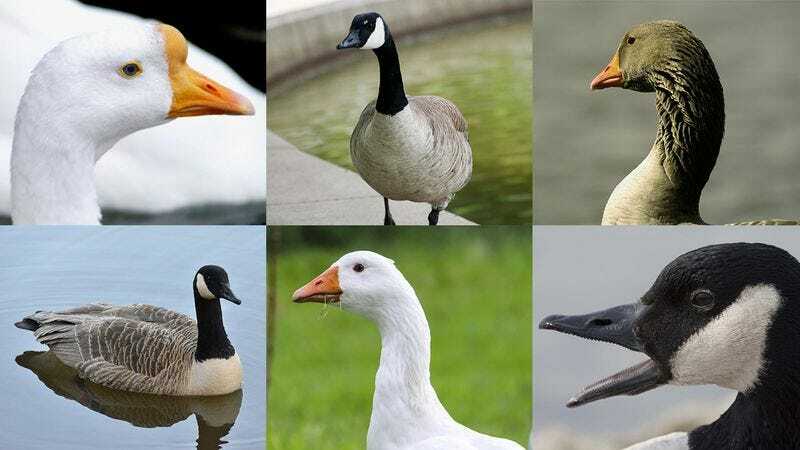 If only more of the geese were like Goose Of Reason, maybe we could put an end to this terrible saga. But until then, my life is truly a living hell.